Tap directly into the findings of an exclusive survey by IDG Research and Sybase with this new white paper that define the current state of mobility. More importantly it underscores specific ways IT can and should behave to proactively deal with the fast-developing world of enterprise mobility. 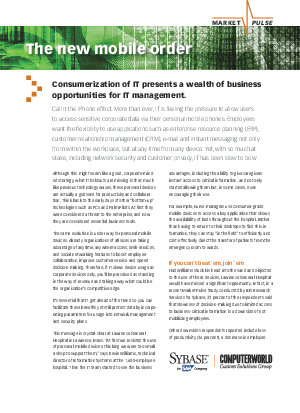 Download it now to learn more about how the “Consumerization of IT” presents a wealth of business opportunities for IT management. Call it the iPhone effect. More than ever, IT is feeling the pressure to allow usersto access sensitive corporate data via their personal mobile phones. Employees want the flexibility to use applications such as enterprise resource planning (ERP),customer relationship management (CRM), e-mail and instant messaging not onlyfrom within the workplace, but at any time from any device. Yet, with so much atstake, including network security and customer privacy, IT has been slow to bow.